Meteorologists can predict the weather by analyzing and interpreting data from observations and tools such as current weather conditions, weather maps, satellites, and radar images. • Changes in the following weather conditions can indicate a change in the pattern of weather. o Wind direction is measured using a wind vane (also known as a weather vane) and indicates the direction of advancing air masses. o Temperature is measured using a thermometer. Changes in the air masses result in changes in the temperature. o Humidity can be measured with sling psychrometers or hygrometers. Humidity is a measure of the percentage of water vapor in the air. Increased levels of humidity can be associated with a high probability of precipitation. o Air pressure is measured with a barometer. A rise in air pressure indicates fair weather while a fall in pressure indicates stormy weather conditions advancing. o Basic shapes of clouds are associated with weather patterns.  Cumulus clouds are puffy with flat bottoms and signal fair weather. However, when they are darker, they may signal rain or thunderstorms, as they develop into cumulonimbus clouds (thunderheads).  Stratus clouds are spread over a large area and are layered. As these clouds thicken long periods of precipitation can occur over the area where the clouds are located. o Weather maps can help predict weather patterns by indicating high or low pressure systems (isobars), movement of air masses and fronts, or temperature ranges (isotherms). o Satellite images are used for seeing cloud patterns and movements. o For example, hurricane clouds and movement can be observed using satellite images. o Radar images can be used to detect cloud cover, rainfall, storm location or intensity, and cloud movement, as well as the potential for severe weather (for example, hurricanes or tornadoes). Station models from specific locations provide information that can also be used to predict weather patterns. Information found on a station model can include cloud cover, temperature (85°F), wind direction and speed, precipitation (* - snow, ● – rain), or barometric pressure (1002 mb). Meteorology is based on probability. Therefore, predictions are not always accurate. 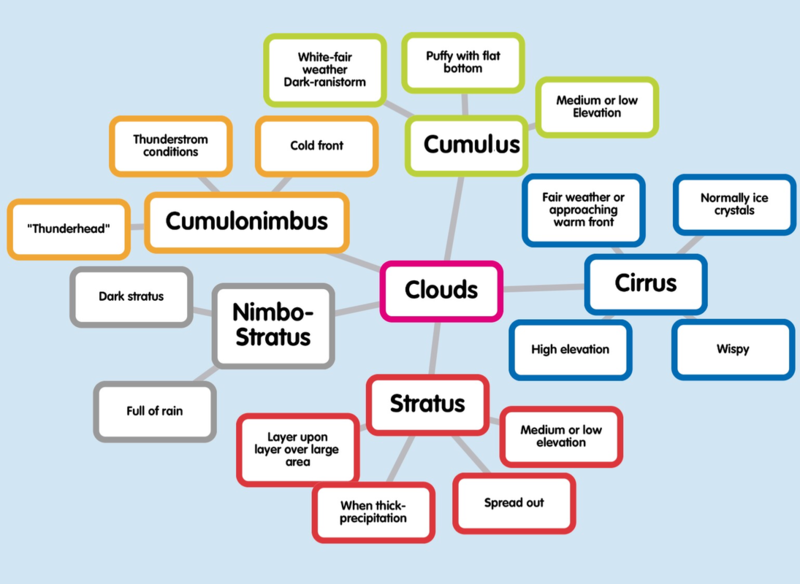 The basic shape name of a cloud can be combined with the appropriate prefix or suffix listed below as clues to the weather conditions that may result. • Combinations of those shapes can be used with nimbus, which means “rain”, for example, cumulonimbus or nimbostratus. • A cumulonimbus cloud, also called a thunderhead, is often part of thunderstorm conditions that may accompany a cold front. • The prefix alto- may also be used to indicate medium-level clouds formed at about 2-6 kilometers up into the atmosphere, for example, altocumulus or altostratus. 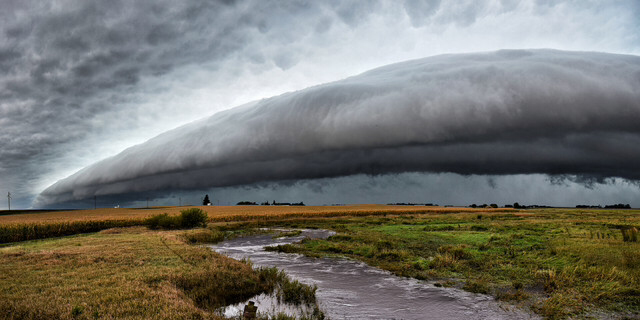 A large shelf cloud slowly approaches over a swollen creek in rural northwest Iowa. Super Awesome Video Link to Understand What Causes Different Types of Clouds to Form! Click button below. Thank you to F.M.S. student, Cole Smith, for doing the Thinglinks!